Uncharted territory and adventurous paths are yours for the taking with this collection of rough-cut natural stones. 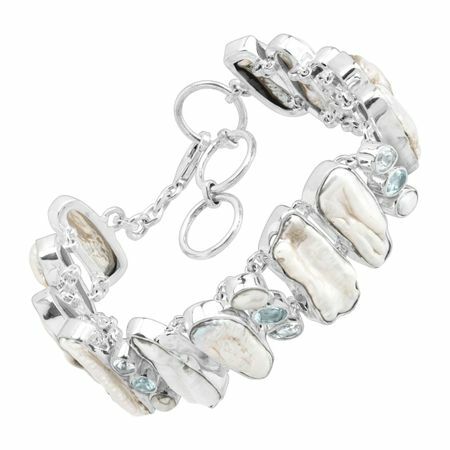 Elongated Biwa pearls and rough-cut blue topaz stones are accented with rounded freshwater pearls in this statement-making bracelet, set in bright sterling silver for style that's ready to go wherever the road may take you. Bracelet measures 7 inches long, plus a 1-inch extender for adjustable length, and features a lobster clasp. Piece comes with a “.925” sterling silver quality stamp as a symbol of guaranteed product quality.